Without further ado, let me jump straight into the products so kindly sponsored to me for my trip. This Gel contains a very high protection with SPF 50+/PA++++ against UVB, UVA and IR rays. It is nourishing with Vitamin E and is also free of parabens, and perfume. Dermatologically tested and Hypoallergenic as well, which is great for sensitive skins. The SPF 50+ Light Gel, in my opinion, is light for the body. When spread across, it's extremely buttery and kind of whipped, which is really great when you want to cover your whole body without having that weird greasy texture which some sunscreens do. I don't really suggest this for faces unless yours tends to be towards the dry side. It was very water resistant and I loved using it whenever I went to swim! Since sunscreen should be applied approximately 20 minutes before sun exposure, I would apply it in my room, head down to the pool, and by the time I remove my robe, it was all well absorbed. The Ultra-Light GelFluid has the same protections against UVA/UVB/IR, etc as the Gel mentioned above and is also equally friendly to the skin. In fact, they have the exact same qualities so I'll jump in to the key product features. Just like the SPF 50+ Light Gel, this is well suited to sensitive, oily, or sun allergic skin - so those who tend to oil up in Singapore's humidity will definitely enjoy this. This Gelfluid (I've never heard it worded this way before, but boy is that the perfect term) is exactly as it says it is. It is SUPREMELY lightweight and goes on like water. Personally, I would advise using this after your last step of moisturiser, and before a primer. For those with drier skins, you could even skip the primer and use this as a makeup base. So just apply this, your bb cream/foundation, concealer and the rest of your makeup. You'll get great protection with great texture. Double plus! The spray has got to be my FAVORITE. It's just so simple to use! As you can see above, when I sprayed it onto my legs, it just absorbed super easily without any stickiness at all due to the liposomal formulation. The packaging also makes for fast and fuss-free application on large areas of the body. Since we all know sunblock normally needs to be reapplied when we are out and about, the easiness of this really encourages us to do so more often versus the traditional spreading of lotion, which is usually more messy. The additional aloe vera and Vitamin E also enhances the goodness it spreads to our skin, so hooray! I feel so grateful for this range and so thankful that I could take it with me to Hainan as well. Though I was kind of dreading taking so many bottles along, it was a pleasant surprise to find that they weren't very bulky, pretty light to carry, and all came in so so so useful! A truly family friendly range that I think works well even for my eczema prone skin, these products are definitely something I stand behind. Wear sunscreen every day, in all weather and in every season. 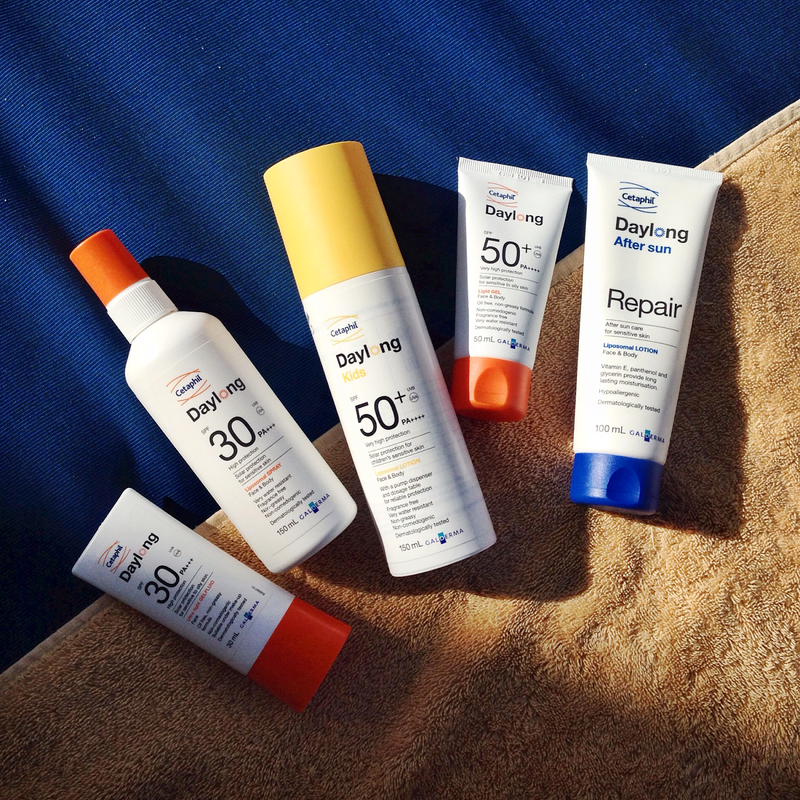 Choose a broad-spectrum sunscreen that can protect against UVA, UVB and IR rays. 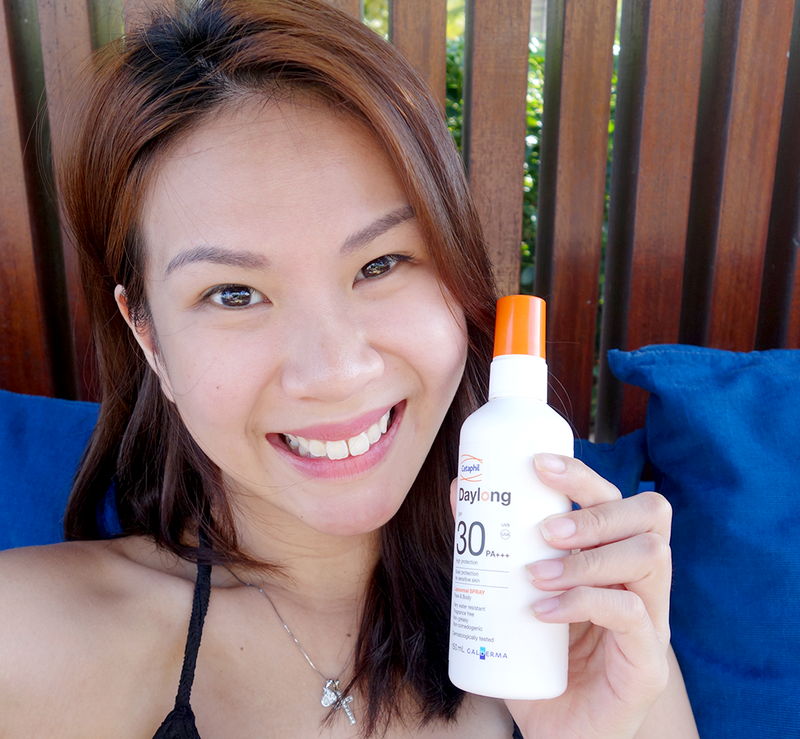 Ideally, a sunscreen should have a UVB protection of SPF 30 and a UVA protection of PA+++. Apply sunscreen at least 20 minutes before sun exposure. Apply adequate sunscreen. The official recommendation is to apply 2mg/ cm2. For the face, use 1⁄2 or 1 teaspoon of sunscreen or 30ml per application for an average adult. Reapply sunscreen after spending a long period of time in the water, especially after swimming, drying off and sweating. Remember to reapply after 4 hours in the sun. Wear loose-fitting clothing that is dark and tightly woven. Wear a wide-brimmed hat and sunglasses when outdoors. Visit www.daylong.com.sg or www.facebook.com/DaylongSG for more information about the Daylong Sun Safety Campaign.